Atom Text Editor is free and open-source, which means you are free to download the application to your desktop and fire away. 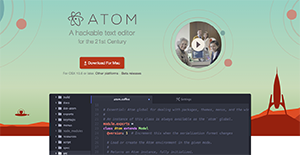 Developed by GitHub, Atom is a fully-featured application that works smoothly on OS X, Windows, and Linux, and lets you write codes faster and smarter, thanks to its flexible autocomplete feature. Since each company has specific business needs, it is prudent for them to abstain from looking for a one-size-fits-all perfect software application. Needless to say, it would be pointless to try to find such a platform even among widely used software solutions. The smart thing to do would be to catalog the various essential aspects that require consideration such as required features, budget, skill levels of employees, company size etc. Then, you should do your groundwork thoroughly. Read some ATOM reviews and check out each of the other systems in your shortlist in detail. Such comprehensive research can make sure you discard ill-fitting systems and select the app that provides all the features you need for business success. How Much Does ATOM Cost? Atom is a free and open-source text editing service that can be installed on Windows, OS X, and Linux devices. We realize that when you make a decision to buy IT Management Software it’s important not only to see how experts evaluate it in their reviews, but also to find out if the real people and companies that buy it are actually satisfied with the product. That’s why we’ve created our behavior-based Customer Satisfaction Algorithm™ that gathers customer reviews, comments and ATOM reviews across a wide range of social media sites. The data is then presented in an easy to digest form showing how many people had positive and negative experience with ATOM. With that information at hand you should be equipped to make an informed buying decision that you won’t regret. What are ATOM pricing details? What integrations are available for ATOM? Pros: I like that I can download bot code interpretation and community run packages. When you write PHP inside of an HTML element the code interprets both HTML code and PhP code so this keeps the software relevant. I started using typescript languag s instead of searching for new text editor. Cons: There is no support for importing from our old system. Pros: It is no short of plugins as it is an open-source. The user interface is simple and you can use the settings to your preference. It offers a great platform on which you can write your plugins without much hustle. Since it is community based, you can find recent plugins from the community with ease as they are updated and developed now and then. Cons: It can be slow for those who use it for basic editing roles. However, when you compare it with Netbeans and Eclipse, it is faster. I also find the plugins for project organization to be very simple. If you need more information about ATOM or you simply have a question let us know what you need and we’ll forward your request directly to the vendor.